Every day, experts make new biological and chemical breakthroughs that will someday have a big impact on our everyday lives. If your products can support their efforts, let them know by using this industrial chemical manufacturing email list to build B2B connections. Chemicals are used to make many things that we rely on, from plastic materials to rubber products to life-saving pharmaceutical preparations. To do this important work, researchers and production-line workers need a variety of tools and supplies, and that's where your business comes in. To inform those who have buying power at biological and chemical manufacturers, get in touch using this chemical products manufacturing industry mailing list. When you buy email leads for a marketing campaign focused on this ever-changing field, it's especially important that you get correct, up-to-date, useful data. We take the time to make sure that each business email list we sell is accurate, so when you buy this biochemical manufacturing email list, you can feel confident that you're making a good investment in the future of your business. All of our pre-built email marketing lists are double-verified on a regular basis, by both machines and real human eyes, to eliminate the problem of outdated or erroneous sales leads. 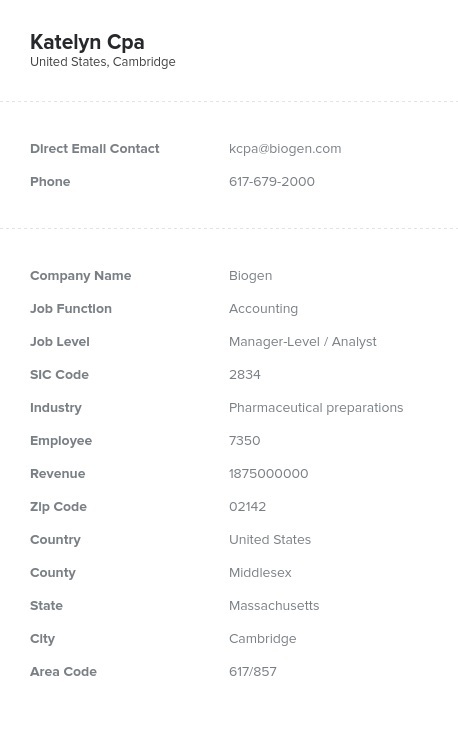 Get the real names, company information, job titles, phone numbers, email addresses, and postal addresses of key contacts in this high-tech field with our chemical products industry email database and you'll be able to form direct, personal connections with potential customers all over the country. Download it today!